Deputy Foreign Minister Olena Zerkal will represent Ukraine. Ukraine has brought the case against Russian in the Permanent Court of Arbitration under the UN Convention on the Law of the Sea, according to President Petro Poroshenko's website. "Ukraine's interests should be adequately protected in the Permanent Court of Arbitration," the president said. Under the president's order, Deputy Foreign Minister Olena Zerkal will represent Ukraine. He said that Ukraine had taken "unprecedented efforts defending its legal positions”. “Today is another stage. 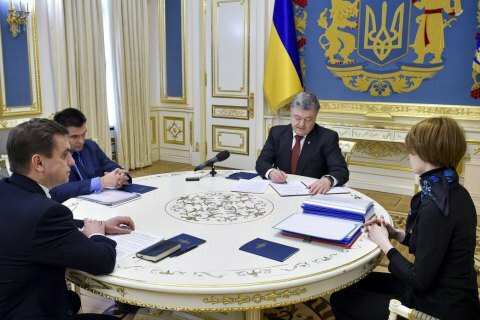 We have drafted the instruction on the representation of Ukraine in the legal proceedings concerning Russia’s violation of Ukraine’s sovereign rights in the Black Sea, Sea of Azov and Kerch Strait,” Poroshenko said. He also said that the economic interests of Ukraine were seriously damaged, in particular, by illegal mining of minerals and construction of the Kerch Bridge without the permission of the state of Ukraine, which leads to significant negative environmental, infrastructure and transport implications. He pointed out that “it doesn’t concern Ukraine’s sovereignty over Crimea”. “This issue is out of discussion and nobody doubts it. It is about the protection of the economic interests of Ukraine and private investors whose property in Crimea was confiscated,” he said. In turn, Olena Zerkal noted that the memorandum, that had already been submitted to The Hague today, outlined the legal framework of the claim regarding violation of the rights of Ukraine under the Maritime Convention. She added that the Permanent Court of Arbitration had set a specific timeline - when and what should be filed. Foreign Minister Pavlo Klimkin noted that the memorandum was the result of the three years of efforts by a powerful international team including prominent international experts, lawyers and academics. The document includes almost 500 annexes. He added that it was the first memorandum which would be followed by the memorandums under the Convention on the Elimination of All Forms of Racial Discrimination and the Convention for the Suppression of the Financing of Terrorism in June. “The things we do are a comprehensive legal attempt to punish Russia along the entire legal frontline. The most important thing is that Russia will not only be punished for violating the rights but will also pay for that,” Klimkin said.